He volunteers nearly full-time as a pottery studio technician at the Dover Art League. He’s a member of its board of directors now, but the title that seems most apt also is the least formal: working artist. Ulry had formal training, including a master of fine arts degree in ceramic sculpture and painting from the University of Missouri at Columbia. 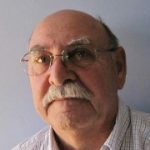 He had a career in art education, having taught junior and senior high school classes and, at the college level, courses in ceramics, 2- and 3-dimensional design and drawing. But a divorce and other personal matters, Ulry says, kept him from most creative pursuits from 1995 until 2012, when he and his current wife, Billie, retired and moved from central New Jersey to Dover. Since then, he has joined two other art leagues (in Rehoboth and Milford) and participates in member and juried exhibits. When he and Billie first moved to Delaware, they lived in a small apartment while waiting for their home to be built. He didn’t want to get into painting or any other medium that might mess up the place. 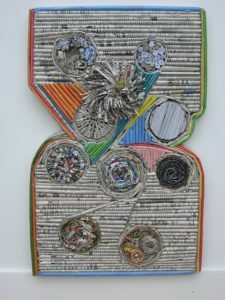 He wanted to work with something inexpensive, which led to a fascination with commonly found paper and cardboard products – junk mail, newspapers, magazines and fliers, for example. 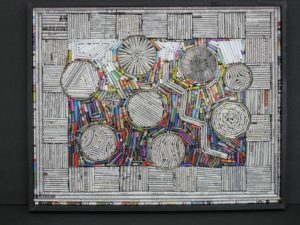 He manipulates the paper, cutting, folding, rolling, gluing or perhaps attaching it with metal hardware into multi-dimensional, textural compositions. 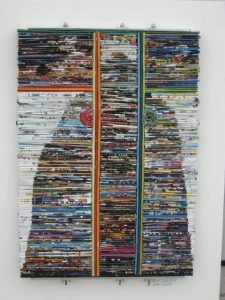 Once he’s created a work, he typically sets it within a shadowbox frame. The Division’s grant will help him purchase framing equipment, a large paper cutter, shelving and storage units. It will help him pay for clay, glazes and kiln firings. Ulry will show his work throughout October at his second home, the Dover Art League.